My Father had found an old mahogany lamp I had made in high school shop class, while cleaning out his garage. The lamp was made more than 25 years ago and wasn’t done very well. The glue joints had all begun to separate, the finish was flaking off and lamp head kept falling off because I didn’t drill the mounting hole deep enough. I probably could have salvaged the lamp fixed it up and made it presentable, but I’m not very nostalgic when it comes to my projects and had no qualms about cutting it up and using the wood for something else. So, I guess you could call this a reclaimed mahogany marking gauge. The base of the lamp had a few holes drilled into it for the lamp cord and once I cut the main body off the base, I instantly saw the makings of a marking gauge. I’m happy with results. Excellent! I really need to make one of these, did you buy some kind of kit for the hardware? No, here’s what I used and where I got it. But I’m sure you can get it all from McMaster Carr. What are you using for the blade? I can’t quite make it out under the screw and washer. What are you using for the blade? I can t quite make it out under the screw and washer. Modified exacto knife blade. I was actually surprised how hard the metal was to shape. Nice job Quikenuff and congratulations on your ‘Daily Top 3’ award. 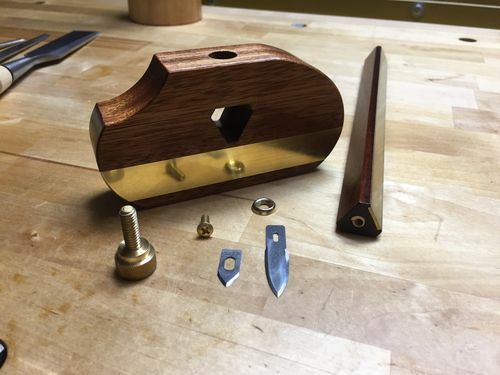 How did you attach the brass to the wood? CA glue? -- An open mind is apt to let anything in....or out! Two part epoxy painted on both sides then clamped with an undersized caul. It’s been holding up well. It’s a beautiful shop made tool and a fine addition to your shop.